Located in Winter Haven, Florida - just 45 minutes from Orlando and downtown Tampa - LEGOLAND Florida is a 150-acre interactive theme park designed specifically for families with children ages 2 through 12. The park, which has the distinction of being the largest LEGOLAND Park in the world, boasts 11 themed zones with more than 50 thrilling rides, as well as a water park, exciting shows and attractions, a lush botanical garden, and a wide variety of shopping and dining options. LEGOLAND Florida attracts as many as two million visitors each year, with summer being the most popular (and most crowded!) season to visit. Timing your visit: Parents who want to beat the crowds - and the oppressive Florida heat and humidity - should consider planning their family's trip to LEGOLAND Florida during the spring or fall, when the park is a bit less packed and the weather is pleasant. Though spring is generally a good time to visit, if avoiding crowds is a goal, it pays to avoid visiting during Spring Break, when there is a surge in park attendance. Hours/days of operation: The park opens at 10 a.m. seven days a week, but may be closed during specific periods on Tuesdays and Wednesdays, so it's best to consult the park's calendar for days and hours of operation before visiting. Several TripAdvisor reviewers recommend visiting during the week to avoid long lines at the park's most popular rides and attractions. Daily shows/special events: If climate and crowds aren't a concern, parents can use LEGOLAND Florida's schedule of daily shows and special events to help determine the best day and time of year for their family's visit. Theme park tickets can be expensive for families and LEGOLAND Florida is no exception. However, purchasing tickets in advance and considering multi-day tickets or annual passes, can help families get the best value for their money. Multi-day/multi-park discounts: One-day, one-park LEGOLAND Florida tickets start at $69 for adults and $62 for seniors and children ages 3 to 12, but two-day passes that also include admission to the LEGOLAND Water Park start at just $99 and $92, respectively, making it possible for diehard LEGO enthusiasts to enjoy the park - and cool off at the water park - for two days for much less than the cost of two separate visits. Advance-purchase: Parents can also save up to $15 per admission by purchasing tickets online, in advance. The advance-purchase discount also applies to all ticket options, including the one- and two-day combo tickets that include admission to both LEGOLAND Florida and LEGOLAND Water Park. Annual passes: For Florida residents, annual passes can also offer deep savings. These passes start at just $15 more than the cost of a one- or two-day pass, include free parking, and are good for one year from the purchase date. Coupons: Some TripAdvisor reviewers report scoring great discounts with the help of online coupons from sites like MouseSavers. LEGO Club Magazine, a free publication, is another excellent source for money-saving coupons. Chart a course: LEGOLAND Florida has an online, printable park map that makes navigating the 150-acre park a breeze. Studying the map the night before visiting makes it easy for park-goers to prioritize their activities and come up with a plan of attack. Pro tip: Head directly to the rear of the park and spend the day meandering back toward the entrance. This ensures shorter lines, and makes it faster and easier to access the parking lot when the park closes. Arrive early: LEGOLAND Florida opens every day at 10 a.m., but savvy park-goers know that getting there at least 30 minutes early is a great way to beat the crowds and ensure a less-hectic start to the day. Use the extra time to sort out parking (there is a $14 parking fee, but it's only $12 if the fee is paid online, in advance), make sure you are hydrated, and slather on the sunscreen before the gates open. Safety snapshot: LEGOLAND Florida is a big and exciting place, and it's all too easy for parents and children to get separated. Use a camera phone to take a quick snapshot of each child before entering the park; this ensures that, in the event of separation, parents know exactly what their child was wearing and can share the photo with park security to aid in the recovery effort. LEGOLAND Florida's minifigure-trading program is a great way for young LEGO enthusiasts to swap out their old, unwanted minifigures in favor of 'new' (and, therefore, more exciting) minifigures. Minifigure trading is simple: just find and approach a LEGOLAND employee with minifigures attached to his uniform and ask to trade. Children can keep the traded minifigure or trade it out again with another park employee. Keep an eye out for the 'Minifigure Ambassador' - a LEGOLAND employee with more than 100 minifigures that are available to trade. Trading rules: Minifigures brought for trade must be complete figures with hair or hat, head, body, and leg pieces. DUPLO Splash and Play: This no-height-requirement play area features interactive water elements and intermittent water spouts. DUPLO Farm: An indoor no-height-requirement play area, DUPLO Farm boasts life-sized, farm-themed play sets, and toddler-sized play tractors. LEGO City: The LEGO City Volunteer Fire Department puts on a slapstick comedy show for toddlers Thursday through Sunday. Imagination Zone: Toddlers can build tall towers - and watch them tumble down - on the rumble tables in the zone's Build and Test area. 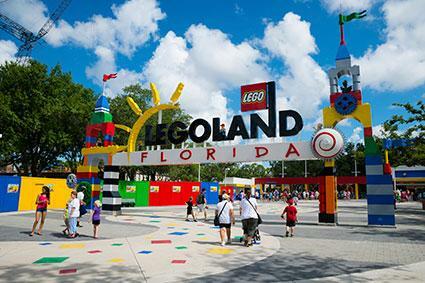 LEGOLAND Florida offers a fun experience for both the young and the young at heart. By planning their visit in advance and taking advantage of helpful park navigation strategies, families can 'build' an unforgettable trip everyone can enjoy.